The Green Line or (pre-)1967 border or 1949 Armistice border is the demarcation line set out in the 1949 Armistice Agreements between the armies of Israel and those of its neighbors (Egypt, Jordan, Lebanon and Syria) after the 1948 Arab–Israeli War. It served as the de facto borders of the State of Israel from 1949 until the Six-Day War in 1967. The Green Line is often referred to as the "pre-1967 borders" or the "1967 borders" by many international bodies and national leaders, including the United States president (currently Barack Obama), Palestinian president Mahmoud Abbas, by the United Nations (UN) in informal texts, and in the text of UN General Assembly Resolutions. The Green Line refers to the demarcation lines, rather than permanent borders, between Israeli forces and those of its neighbours. All movement across the demarcation lines was banned and monitored by the United Nations Truce Supervision Organization. 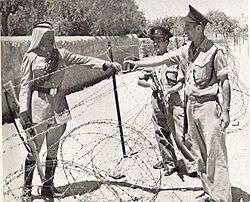 Most commonly, the term was applied to the boundary between Jordan-controlled Jerusalem and the West Bank and Israel. The drawing of the Green Line superseded entirely the partition lines proposed and voted on by the United Nations in the Partition Plan of 1947 and which Israel had accepted in the Israeli Declaration of Independence. The Palestinian and Arab leaders had repeatedly rejected any permanent partition of Mandatory Palestine. In 1967, after Israel seized all the territories of the former Mandatory Palestine, as well as other territories, the demarcation lines became militarily irrelevant, and the status of the Green Line became uncertain. The extension of the municipality boundary of Jerusalem in 1980 was an exception to this position. 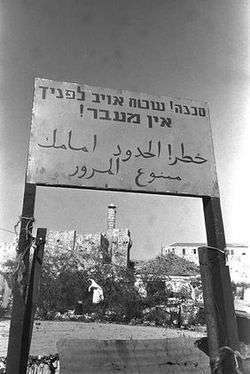 Although Jerusalem was a part of territory beyond the Green Line that was occupied by Jordan until 1967, Israel declared Jerusalem "complete and united" as the capital of Israel according to the 1980 Basic Jerusalem Law. This claim has not been recognised by any country or by the United Nations (UN) Security Council. A notional Green Line continues to divide Jerusalem at the boundary of East Jerusalem. The Golan Heights are another exception, having been informally incorporated by Israel with the 1981 Golan Heights Law. The UN Security Council declared this to be null and without any international legal effect. Israeli settlements in these areas are essentially subject to the laws of Israel rather than those of the Palestinian Authority. During the war in 1947-48, Jews residing east of the Line, including the Jewish Quarter of the Old City, were taken prisoner by the Jordanians. All but a few of the Gush Etzion defenders were massacred. The prisoners were returned to Israel after the war. On July 8, 1948, the Jewish inhabitants of Kfar Darom and Naharayim were evacuated by Israel due to military pressure by Egypt and Jordan. Israel also withdrew from villages in the Lebanese Upper Galilee, whereas Syria withdrew from Mishmar HaYarden. The question of whether, or to what extent, Israel should withdraw its population and forces to its side of the Green Line remains a crucial issue in some discussions surrounding the Israeli–Palestinian conflict. There is a near-unanimous international consensus that Israel should withdraw to its side of the line. This has been expressed in the yearly UN General Assembly vote on the Peaceful Settlement of the Question of Palestine. Although disputed by Israel, UN resolution 242 has declared the interpretation of international law regarding Palestinian Territory. The Palestinians were not party to the drawing of the Green Line and they rejected UN resolution 242, saying that it did not call for an independent Palestinian state, and referred to them as refugees. Since 1976, most elements in the PLO have accepted the pre-June 1967 line as a basis for the establishment of a Palestinian state. In the early 1980s, American intellectual Noam Chomsky argued that Israeli claims that the Palestinian leadership rejected the international consensus calling for a Palestinian state, with borders along the Green Line, were not consistent with the documented record. In 2008 Al Jazeera and Haaretz both reported that elements in the Palestinian leadership, even inside Hamas, have called for a two-state settlement based on the pre-June 1967 borders (the Green Line). Although Hamas' official policy is committed to Israel's destruction, Ismail Haniya, the prime minister of the Palestinian unity government until June 2007, suggested that a long-term truce with Israel could be achieved if Israel withdrew from territory occupied in 1967. According to Hebrew University geographer Ilan Salomon, the Green Line can be discerned from space via satellite; it is marked by pine forests planted by the Jewish National Fund to demarcate Israeli territory. Salomon and Larissa Fleishman conducted a 2006 study regarding Israeli students' knowledge of the location of the Green Line, and they found that not much more than ⅓ could identify its placement. They learned that "students who identify with left-leaning parties are more familiar with the location of the West Bank and the Gaza Strip, can sketch them more accurately and are also more aware of the nature of borders." 1 2 Bernard Lewis (1993). Islam in history: ideas, people, and events in the Middle East. Open Court Publishing. p. 164. ISBN 0-8126-9518-6. ↑ "The Committee on the Exercise of the Inalienable Rights of the Palestinian People (CEIRPP) is mandated by the UN General Assembly to (...) support the peace process for the achievement of the two-State solution on the basis of pre-1967 borders..."
1 2 Anthony Aust (2010). Handbook of International Law By Anthony Aust. https://books.google.com/books?id=74Zmct-7hGIC&pg=PA27: Cambridge University Press. p. 27. ISBN 978-0-521-13349-4. 1 2 Ian Lustick (January 1997). "Has Israel Annexed East Jerusalem?". Middle East Policy. V (1). Archived from the original on 2007-06-10. Retrieved 2007-07-08. ↑ Mohammad Taghi Karoubi (2004). Just or unjust war?. https://books.google.com/books?id=D9mI3Nqug5EC&pg=PA120: Ashgate Publishing. ISBN 978-0-7546-2375-5. ↑ "סקר: יותר ישראלים רואים במתנחלים "מכשול לשלום"". Walla!. 11 June 2016. Retrieved 10 October 2016. ↑ "S/RES/476 (1980) of 30 June 1980". domino.un.org. Retrieved 2015-10-01. 1 2 "THE GOLAN HEIGHTS ANNEXED BY ISRAEL IN AN ABRUPT MOVE". www.nytimes.com. Retrieved 2015-10-01. ↑ "Golan Heights Law - Center for Israel Education". Retrieved 2015-10-01. ↑ "S/RES/497 (1981) of 17 December 1981". unispal.un.org. Retrieved 2015-10-01. 1 2 S. M. Schwebel (1970). "What weight to conquest?". American Journal of International Law. 64: 344–347. ; reprinted in S. M. Schwebel (1994). Justice in international law: selected writings of Stephen M. Schwebel. https://books.google.com/books?id=ZWJTqMjA5OkC&pg=PA524: Cambridge University Press. p. 524. ISBN 978-0-521-46-284-6. ↑ Hoffman, Gil. "Poll: 77% of Israelis oppose going back to pre-'67 lines". jpost.com. Jerusalem Post. Retrieved 16 June 2015. ↑ Barahona, Ana (2013). Bearing Witness - Eight Weeks in Palestine. London: Metete. p. 52. ISBN 978-1-908099-02-0. "The Green Line"
David Newman, "Boundaries in Flux: The 'Green Line' Boundary between Israel and the West Bank - Past, Present and Future", Boundary & Territory Briefings, Vol. 1 no. 7, 1995. Ben-Dror, Elad (2015). Ralph Bunche and the Arab-Israeli Conflict: Mediation and the UN 1947–1949,. Routledge. ISBN 978-1138789883.